Also pub. by L. Davenport & Co., London, U.K. Comments: Illustrated by Clayton Rawson. 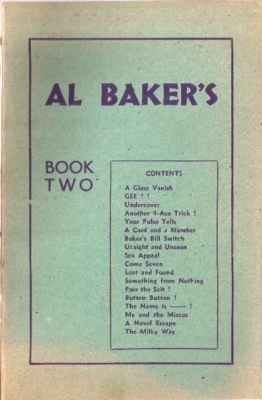 Also found as Al Baker's Second Book. 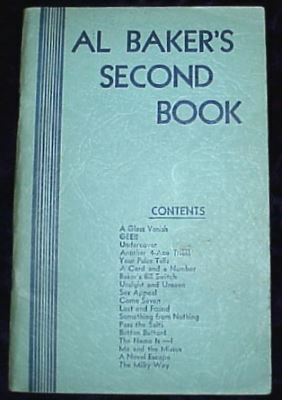 This book is also part of the compilation, The Secret Ways of Al Baker, published by The Miracle Factory, and has also been reprinted by another publisher along with Book One in a single volume. It is available as an e-book from The Learned Pig Project. 6 Gee! : Magician states he will cause two selections to vanish from deck; two cards are removed and prove to be the selections, and the rest of the deck vanishes instead.